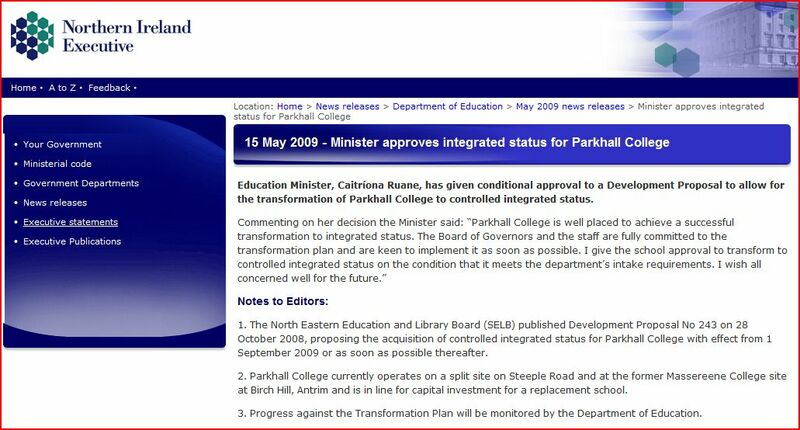 Recent reports in the Antrim Guardian have suggested that certain Parkhall Governors have “rebelled” against the transformation of the school to integrated status. This follows on claims by the newspaper that integration was “on hold”. Careful fact-checking tells a different story. PACE have confirmed with the DENI that no such category exists and that if the requisite 10% enrolment from the Catholic community does not occur when school opens next week then a letter will be sent to the Board of Governors, NICIE and the NEELB regarding the legal status of the school. Perhaps the public would benefit from the ability to examine the minutes of a Board of Governors meeting held to discuss only one agenda item – the proposal to transform the school to integrated status. 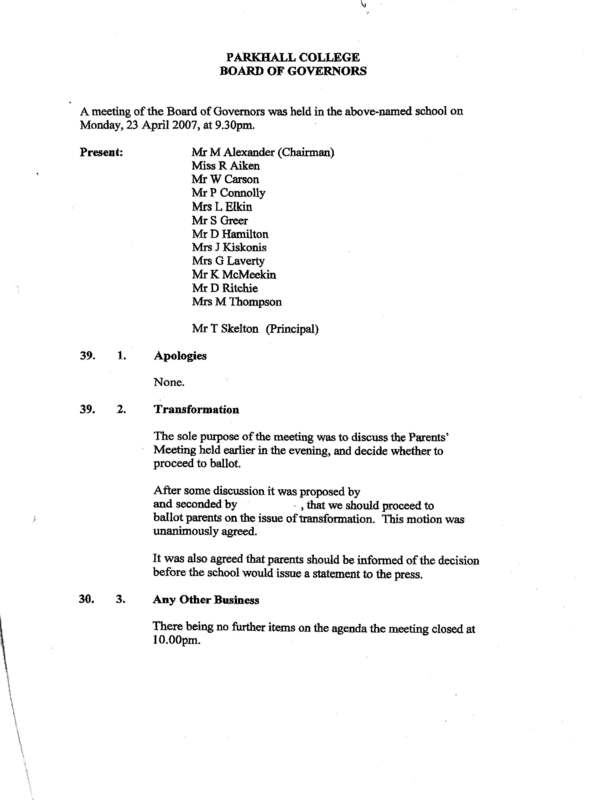 While the Antrim Guardian reported on July 9th that a “Second Governor rebels against Parkhall College transformation” the minutes of the Board of Governors meeting tell a different story. Readers should note that the recently returned mayor, Adrian Watson, a Parkhall BOG member was not present at the meeting nor were his apologies recorded. 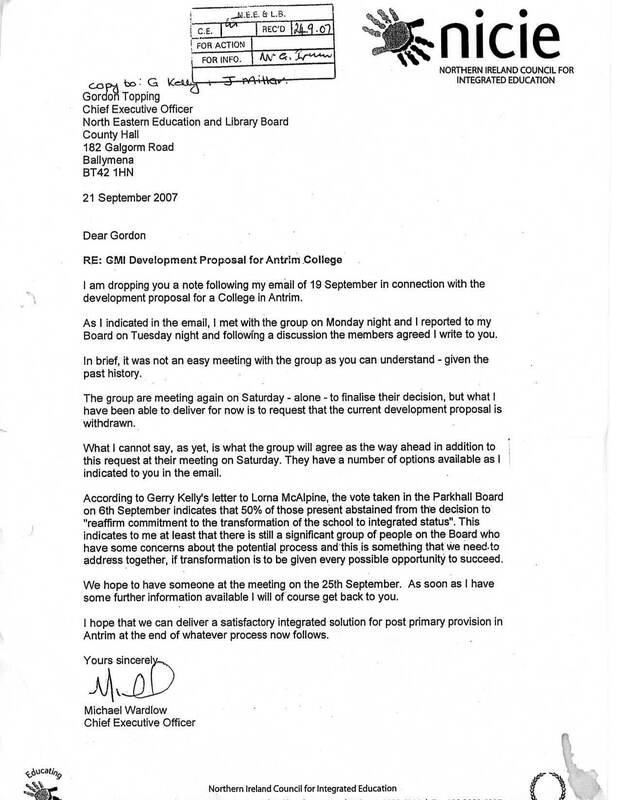 Mr Karl McMeekin criticised the NEELB for forcing three votes on parents in order to get integrated status “one way or the other” His decision to support the transformation ballot exercise on April 23 2007 is a matter of public record thanks to FOI and PACE.